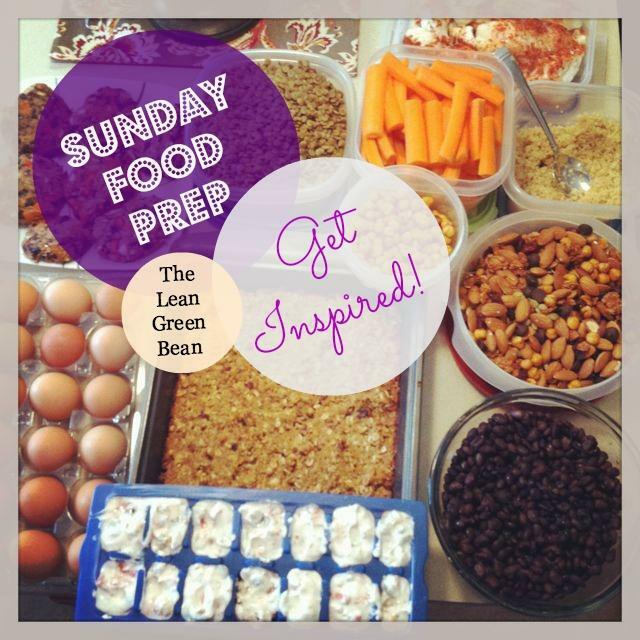 The Sunday food prep inspiration just keeps coming! And i love it! And here’s what you guys have been up to! 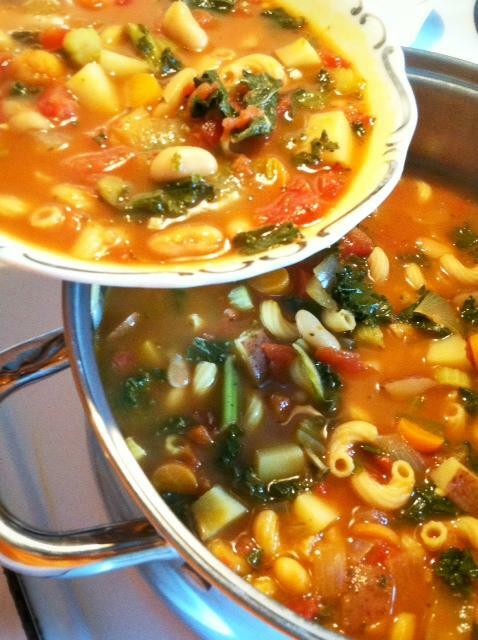 “I made minestrone soup to carry my family through a chilly weekend while I’m away.” For the recipe, CLICK HERE. 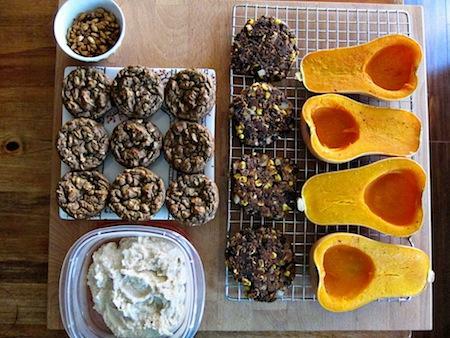 This weekend I made roasted pumpkin seeds, Banana Brownie Protein Muffins (from Petite Athleat), Bob Harpers Signature No-Oil Hummus, Simple Smoky Black Bean Burgers (from Edible Perspective), and roasted some butternut squash for pasta sauces and for quesadillas (inspired by your blog!). This is how I prep. I make a breakfast frittata every Sunday to have for breakfast every morning since I go to the gym at 6am. I just take a piece and warm it up at work! Here’s the recipe: A dozen eggs, turkey breakfast sausage, onions, sweet potatoes, red and green peppers and zucchini. Season egg mixture with basil, parsley, garlic powder and a little ground pepper. Saute the veggies and sausage for a few minutes, add the eggs, cover and cook over low heat until cooked through! 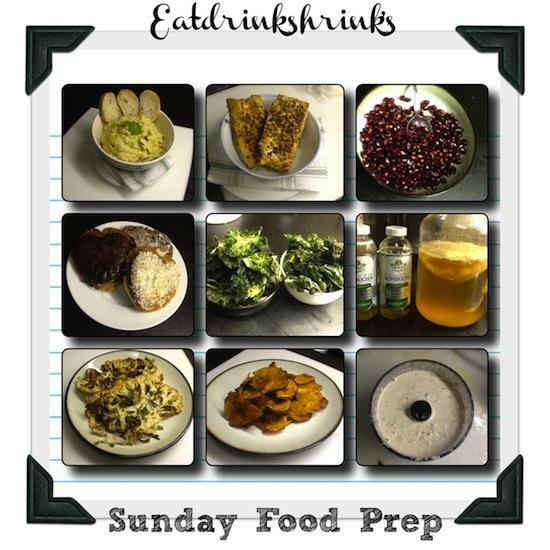 This week’s Sunday food prep consisted of lots of staples that make putting together meals a breeze when it comes to the week. All too often there just isn’t enough time during the week. Each weekend I spend 1-2 hours putting together bases of meals, so each day can be different and I’m prepared for the week ahead! I make a basic salad that’s full of romaine, spinach, cucumbers, bell peppers, and grape tomatoes so all that I need to do is add some protein to it! I baked some chicken and hard boiled some eggs, which I can easily cut up and add to this salad base. I can also add the chicken to the batch of quinoa that I made. I love hard boiled eggs for snacks or to make egg salad. Individual spinach herb frittatas and quinoa breakfast bars for breakfast or snacks also make going through the week easy. 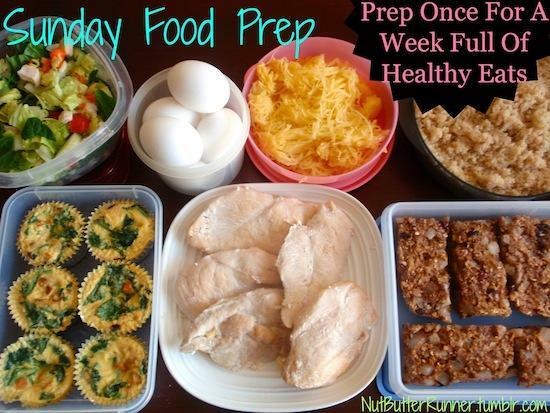 Prep once and have a week full of healthy eats! I prep on Sunday’s lots of hummus, I love to make a Spanish version as I love avocado’s and guacamole goes bad very quickly! I also like to make baked almond crusted tofu with the leftover almonds from making homemade almond milk! 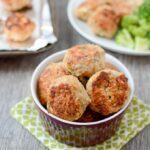 Just bake the leftovers and use as a flour replacement or crust tofu with it! I buy lots of fresh pomegranate and remove the seeds for an easy morning grab and go breakfast! 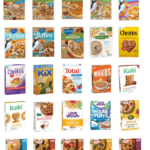 Since there are so many options of great baked vegan goods I pick a few up for the week in case I need a little sweet something while studying! These are vegan doughnuts by the Vegan Divas in the NYC! I always make fresh Kombucha tea and sweeten it with stevia and store for when I need some natural probiotics when on the go! I like to make a fresh batch of baked cauliflower with garlic and rosemary for a evening meals as its a perfect addition to any meal and taste amazing! I like to have fresh almond milk ready for when I need a dairy alternative and make a fresh batch each Sunday!! 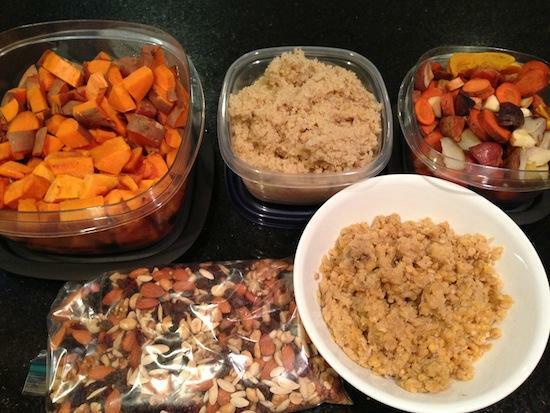 Sweet potatoes + butternut squash roasted and chopped, quinoa, potatoes + carrots + parsnips roasted and chopped, trail mix (raw almonds, peanuts, walnuts, pumpkin seeds, cranberries, raisins, and #veganchocolate chips), and lentils. Being a graduate student can really take a toll on someone’s health. Some days I’ll be on campus from 6am-6pm and the last thing I want to do when I get home is make dinner, or even worse make breakfast when I’m getting up so early! I’ve realized that the only way to maintain a healthy lifestyle in a way that I can get enough sleep, homework/research done, and eat healthy is to prep some meals. 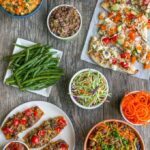 Especially with living a paleo lifestyle, it means that a lot of food I need to prep from scratch, meaning a few hours over the course of the week in the kitchen. This Sunday I made a meat crust quiche (made 6 pieces which means it’s enough for the whole week! ), cut a green apple to top my spinach salad, & pre bagged carrots for my lunches. I also cut some fruit to make a fruit salad, and yesterday I made some crockpot shredded beef which will last me a few more days for lunch! 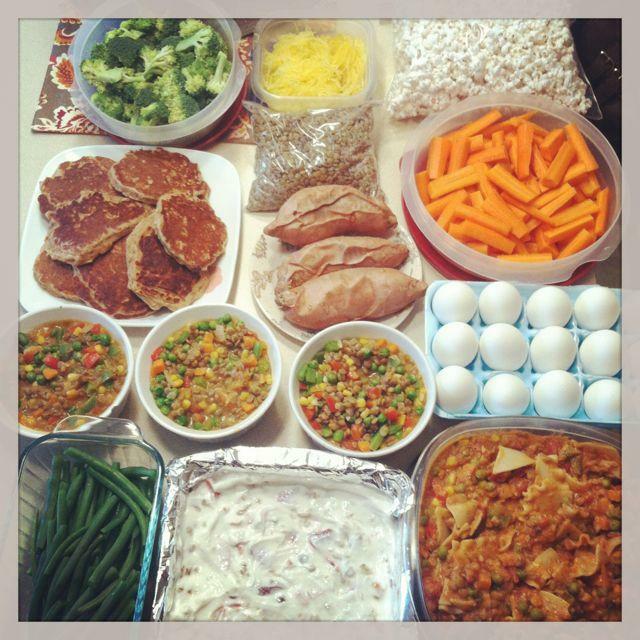 While prepping food takes time, I know that it’s worth it for my health, fitness, and sanity!! I wanted to bring something to the Oscar Party I was attending that could also serve as my lunches for the week. I decided on Pasta Salad (whole wheat noodles, of course!) and made one batch for the party following the recipe exactly (broccoli, peas, and diced tomatoes), and a second batch that I doctored up. For my lunches I used less oil and I added white beans, extra peas, red bell peppers, and celery. I made so much that both Mike and I will have it for lunch the next 5 days! For breakfasts, I was inspired by an Indian Cooking Class that I took so I made a “Halwah” porridge out of Cornmeal, Carrots, Coconut, Raisins and Soymilk. I used a little bit of Coconut Palm Sugar and extra raisins for the perfect amount of subtle sweetness. We also have celery, carrots, grape tomatoes, clementines, kiwis, and bananas for grab & go snacks. 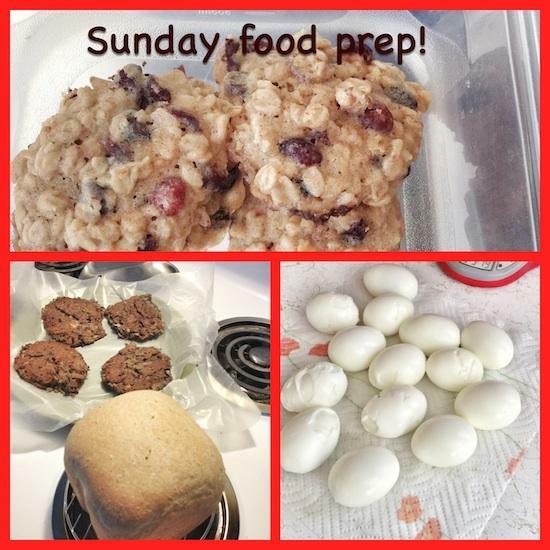 I made hb eggs, fresh bread, black bean and tuna burgers and cranberry oatmeal cookies made with Chobani! I also made some rice (which we’ll use for the boys’ dinner some time this week), roasted veggies (for the boys’ lunches and dinners). I used some of the quinoa in the veg burgers and I’ll use some to make quinoa blueberry pancakes sometime this week. Also planning on a quinoa, kale, avocado salad and maybe another salad for lunch. The spinach soup will be dinner one night this week and the rest goes in the freezer. Granola because everyone needs more granola. Ditto for the frozen yogurt bites. Muffins will be breakfast once this week, maybe a snack but the rest goes in the freezer. I really try to make an effort to food prep during the weekend for the week ahead. Sometimes the food prep happens and sometimes it doesn’t. 😉 I will tell you, that it is much easier to make good decisions when you have healthy choices already prepared and ready to go. 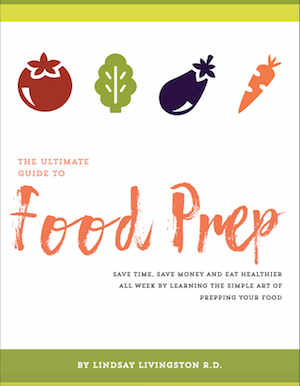 Last weekend, I did a major food prep session and I’ll tell you; it has been so nice to not have to worry about what to make for breakfast, lunch and dinner. 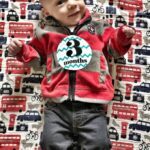 My slow cooker helped me out in a major way! I used it to make Banana Blueberry Steel Cut Oats and a Southwestern Chili. I roasted tons of veggies to snack on and use as sides throughout the week. 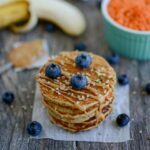 My favorite snack is apple slices with seed or nutbutter, so I experimented with a new flavor of sunflower seed butter this weekend, to have on hand for the week. This sunflower seed butter also went great with the steel cut oats. Muffins are one of my favorite foods to have on hand because they can be a snack, breakfast or side. 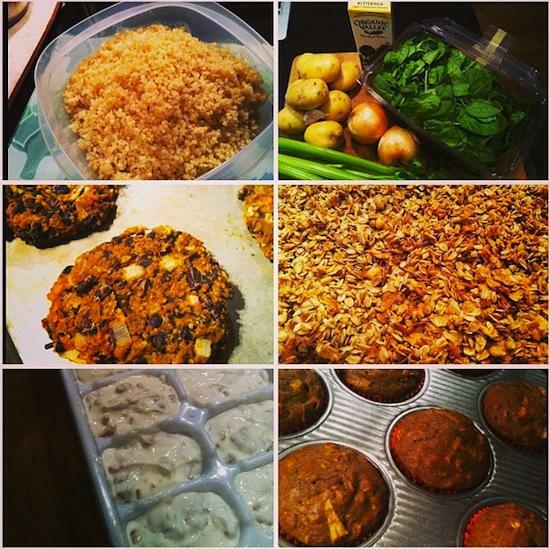 I made my Paleo Pumpkin Muffins, an old favorite and they didn’t disappoint! Last, I made some homemade Coconut Cream Pie Larabars; which makes a great snack for the kids. Unfortunately, my husband pretty much hogged these from the rest of the family…..I only got one bar! Whew! Inspired yet? I know I am!! Let’s chat: What are you prepping this weekend?! Seriously!! Everyone’s entries are so inspiring! I’m off to prep. I cooked a batch of beans and shredded chicken yesterday. Today will be some peanut butter, quinoa and ground bison. I love this! 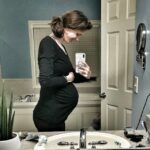 I am so inspired… I’m going to stop typing and start cooking! Headed in the kitchen right now! you’re the best! great job! It’s definitely inspiring to see what everyone is making. I’ve only done a little food prep the last couple weekends due to social engagements. You guys have convinced me to at least make a batch of hard boiled eggs and some quinoa, though! 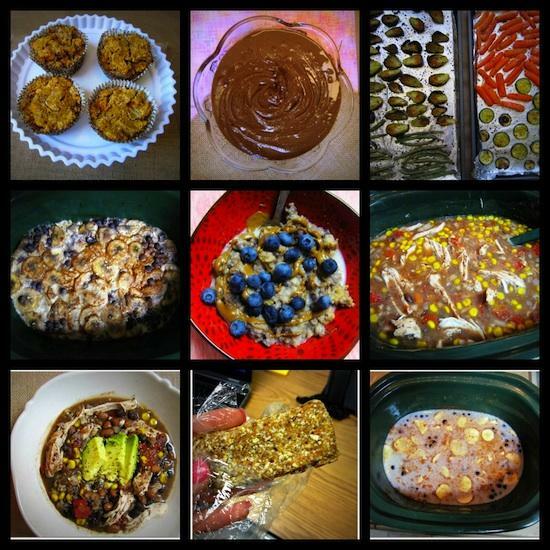 BTW, I made your Quinoa Breakfast Bars last weekend I liked them a lot! 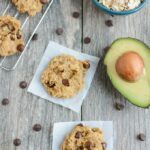 I actually made them for my husband who refuses to eat oatmeal and he said they were ‘not bad’ which is pretty high praise, haha. You definitely have a knack for creating recipes. Thanks for sharing them with us. Have a great week! yay! i’m so glad you guys liked them!! and for food prep, every little bit helps! 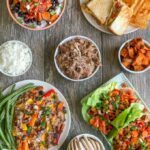 Love this weekly meal prep roundup! Thanks. Wow! Everyone has such great ideas! Super inspiring. So far I have some hard boiled eggs. 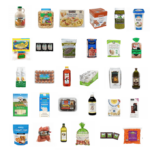 Thinking about trying some quinoa for the first time! awesome! let me know what you think of it! I love all this inspiration! THIS is a FABULOUS post! Must make meal prep a habit!! Thanks for including everyone! I love scrolling through all the pictures. I wish I could food prep today, but I’m going out of town later on in the week, so prep = no go! you’re such a rockstar! i’m so proud of you! I love this! 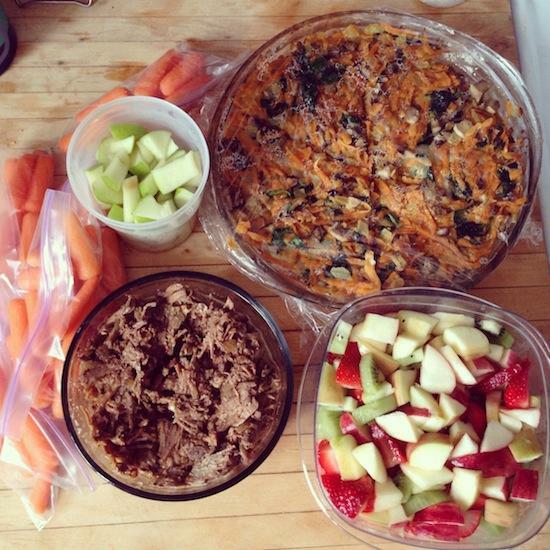 Planning makes the healthy eating so much easier and convenient. I love that you include all the readers prep as well- I’m feeling so inspired!! We just made a chicken in the crockpot, so there’s lots of leftovers for other meals this week. And I need to make a big batch of quinoa and maybe get some veggies chopped… enjoy the rest of your Sunday! I’ve been really bad about food prep lately. I need to work on that! Totally loving this post!! 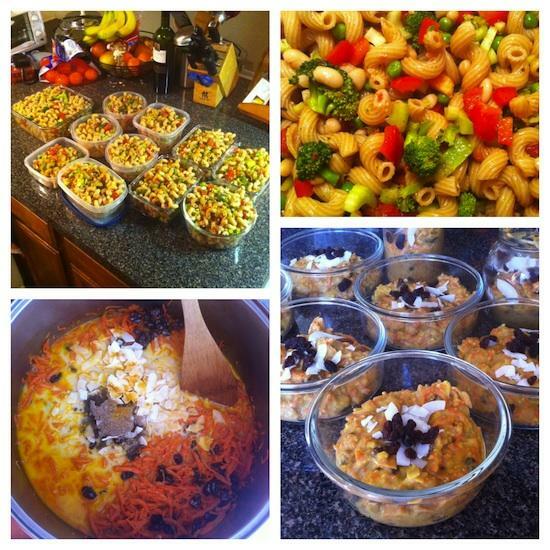 I love that you’re showcasing other’s meal prepping!! 🙂 It motivates EVERYONE to jump on the meal prep bandwagon! PS: those whole roasted butternut squash, I could just dig a spoon in them and go to TOWN! I love all these ideas! I am on spring break this week and am hoping to make some foods to freeze throughout the week to have for the following weeks! I want to make your lentil pot pie and some kind of turkey or veggie burger! awesome! enjoy your week off! I love seeing so many people be healthy and prep ahead!! My weekend was totally swamped and I didn’t get around to prepping until last night! I threw a roast in the slow cooker to have some shredded pork and I plan to make some sauces this week for it. I also made a batch of smashed cauliflower to go along for lunches this week! I have no fresh produce right now so I’m headed to the grocery store after work! Wow guys, this isn’t just food, these are works of ART! 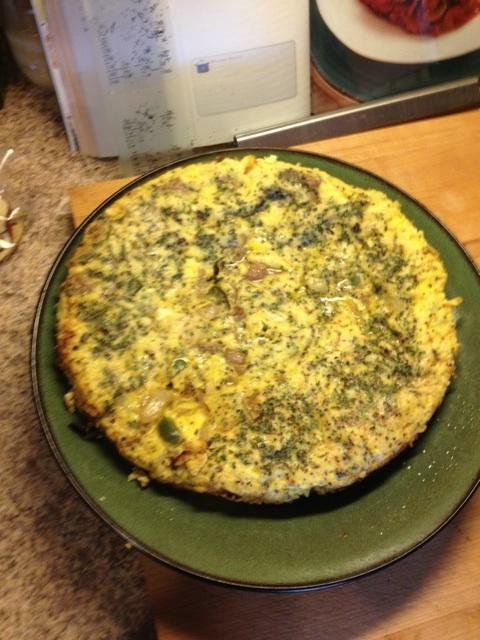 I absolutely love Sam’s refreshing minestrone soup and Mitchell’s breakfast frittata. I can’t wait the weekend to experiment with your recipes. [WORDPRESS HASHCASH] The comment’s server IP (65.254.225.149) doesn’t match the comment’s URL host IP (65.254.248.218) and so is spam.